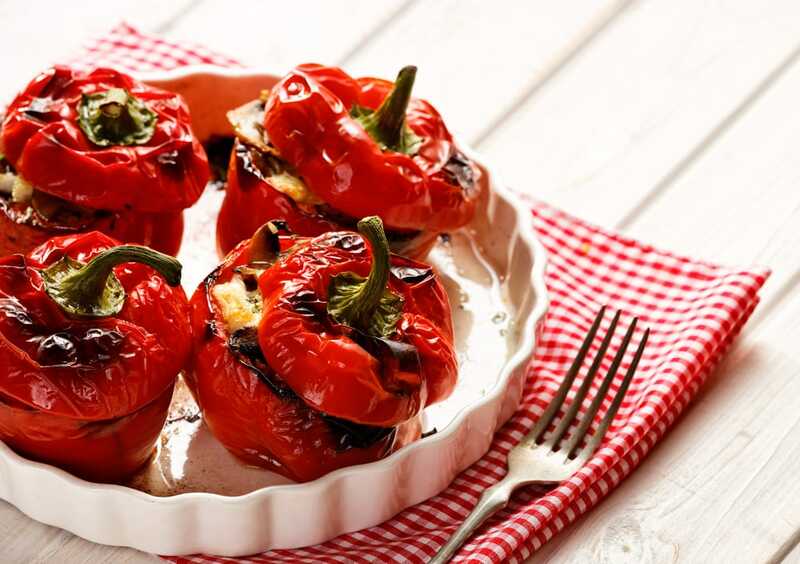 Our Oven-Charred Tomato Stuffed Peppers recipe is the perfect dish to add to any dinner or lunch. With a total time of 75 minutes, this delicious recipe serves 6 people and is dairy-free! 1.Preheat oven to 425℉ and center a rack. Place a deep-dish on a baking sheet lined with Gefen Easy Baking Parchment or a silicone baking mat. 2. Spread a tablespoon or two of oil over the bottom and sides of the pan, then scatter the garlic slices, half of the herb sprigs, half of the basil and season with salt and pepper. 3. Stir the bread crumbs and anchovies together in a small bowl. Grate the zest of the lmon over and squeeze in the juice from half of the lemon (about one tablespoon; don’t worry about precision). Cut 6 thin slices from the other half of the lemo, then cut the slices in half; set aside. 4. If any lemon remains, squeeze the juice over the bread crumbs. Stir in one tablespoon oil and season the crumbs with the piment d’Espelette or cayenne. Season salt to taste. Note: Anchovies are salty, so the seasoning might be just fine. 5. If preferred (or need room in the pan), trim the peppers’ stems. Slice the peppers in half the long way and remove the ribs and seeds. Spoon out an equal amount of the breadcrumbs mixture into each pepper, scatter the remaining basil over and top each one with two lemon slices. Divide the tomatoes among the peppers, placing them as close together as you can, and season with salt and pepper. 6. Transfer the peppers to the pie pan, crowding them together and cajoling so that they all fit. Drizzle over enough of the remaining oil to lightly moisten the tomatoes and then strew over the remaining herbs sprigs. Note: Peppers can be prepared ahead of time. 7. Bake the peppers for about a hour or until soft as preferred. Remove and discard the herbs from the top of the peppers. 8. Serve peppers from the over, warm or at room temperature. Drizzle with oil, top with ricotta, and sprinkle with chives or other herbs if preferred.